Participating cast members will include Ian Ziering, Tara Reid, Ryan Newman, Stacey Dash, Cody Linley, Masiela Lusha and Director Anthony C. Ferrante. 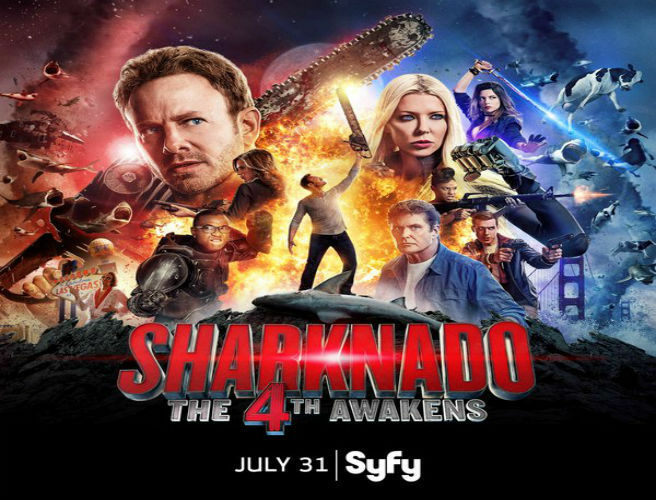 Leading independent film production company, The Asylum is proud to announce that the cast of pop culture phenomenon SHARKNADO will be returning to San Diego Comic Con this year with the SHARKNADO 4 panel, “Sharknado: The 4th Awakens”. The cast and director will be on hand to share stories with fans, premiere exclusive content and participate in a fan Q&A. The SHARKNADO 4 panel takes place on Friday 7/22 (more details below) and will premiere on Syfy July 31, 2016 at 8pm. PREVIOUS POST Previous post: REGULATORS… MOUNT UP! WYNONNA EARP RIDES TO SAN DIEGO COMIC-CON 2016!